Almost every year I replay Jedi Knight II: Jedi Outcast. It's not because I'm a huge Star Wars fanboy - although I do think the fiction is pretty cool - nor is it because there remains, to this day, nothing better in the category in my opinion. No, its because Outcast succeeds where so many others have failed - it gets lightsabers right. Jedi Knight II gets a hell of a lot of other things right too, which we'll get to later, however first and foremost it succeeds as it successfully captures both the extreme power and also isolated vulnerability you would experience if you truly were wielding a blade made entirely out of energy. It may be over a decade old, but Jedi Knight II remains loads of fun to play. And, don't be fooled, I'm not exaggerating with the failures. So many games have totally failed to put a fiction-realistic lightsaber in your hands - Star Wars Episode 1: The Phantom Menace game we're looking at you - and so many more have completely misjudged what it is, according to the fiction, supposed to be like to be a force user. In terms of the saberplay, the physics in these lesser titles is never right, with the blades given no real presence in the virtual world. They are just immovable, solid blocks with zero individual properties. Every blade is the same and every blade handles and acts like it's made out of the core of a neutron star. The weapons don't feel like they exist, even within the virtual world the game is depicting. They are also treated essentially as a win button, with anyone who whips one out turned into an indestructible demi-god who can take on entire armies single-handedly. This latter point is demonstrated well in the massive flop Star Wars: The Force Unleashed II, which turns you into a sort of hyperactive, indestructible tasmanian devil capable of ripping the legs off an AT-ST and beating another to death with them. Yes, the graphics are dated but the lightsaber combat is top rate. Tell me, where in any of the films does Obi-Wan take on a pair of AT-STs? And that's the point. Jedi Knights and Sith Lords are powerful in the Star Wars fiction sure, more powerful than most of the other characters that inhabit the Star Wars universe, but they're not immortal. You shoot a Jedi with a blaster and they die. Heck, even the prequel trilogy got this right! Yes, the lightsaber can be used to deflect laser fire but, if one gets through, then it's all over. Now look, I'm not saying that Jedi Knight II is one-hit, one-kill - although if you play it on 'Jedi Master', the hardest difficulty mode, then it basically is with the more powerful weapons - and that is why it's great. No, what I am saying is that Outcast has a fundamental understanding that the people who wield the force are still human (or humanoid aliens). As such, while you carry round a very powerful weapon and have access to some equally powerful force powers, you are actually rather vulnerable most of the time. Get hit by an enemy's rocket or laser round and you can kiss goodbye to your health. And don't even think about walking through armoured walkers or other lightsaber users - you'll be put down so hard that when you come to you'll swear that Jar Jar Binks is the best character in all of Star Wars. Force Lightning, one of the numerous Dark Side powers you can harness to end your foes. No, if you use the lightsaber in Jedi Knight II then you not only need to plan your tactics well, you also have to wield that lightsaber correctly. This lightsaber duel with Dark Jedi Tavion is one of the best in the game. And so we come to the best part of Jedi Knight II - the lightsabers. The lightsaber system in Jedi Knight II is, despite its age, still fantastic, creating thrilling battles whenever two saber-wielders come together. It's based on a stance system, which allows you to wield the lightsaber in one of three styles, fast, medium and strong. These stances differ how you swing the blade and the amount of damage you do with each strike. They also alter the angle the blade rests at when not being swung. Attacks with the sabers vary not only in style but also depending on the movement commands you are inputting when you actuate an attack. For example, if you press back and a diagonal together, then your character will execute a diagonal upwards slash, while if you press forwards and diagonal you swing a downward slash in the chosen direction. Forward attacks, backwards attacks and side attacks are all possible and vary depending on what style you are using. Each style also has its own unique attack too that you cannot execute when using a different style. One of the numerous cantinas in Jedi Outcast - the music is suitably rinky-tink. The fast style puts an emphasis on chaining rapid attacks together, which when combined with good movement, can help you take down multiple lesser opponents quickly. The fast style does have poor range though and damage dealt per blow. The medium stance is the all-rounder and is the most balanced of the styles, offering decent range, speed and damage, while the heavy stance is the slowest but most powerful style, offering extreme range and stopping power but also demanding perfect timing per swing. Now let's talk about the general saber physics. Firstly, each lightsaber is not glued to their user's hands. The sabers can be thrown, knocked from an opponent's hand and influenced with force powers (such as Force Push and Force Pull). For example, if you throw your lightsaber at an opponent and he blocks it, it won't just magically return to you, you need to pull it back in. Of course, the fact that you can be disarmed makes the lightsaber play even more engaging. Lightsaber fights can get really intense, requiring good movement and defence to stay alive. 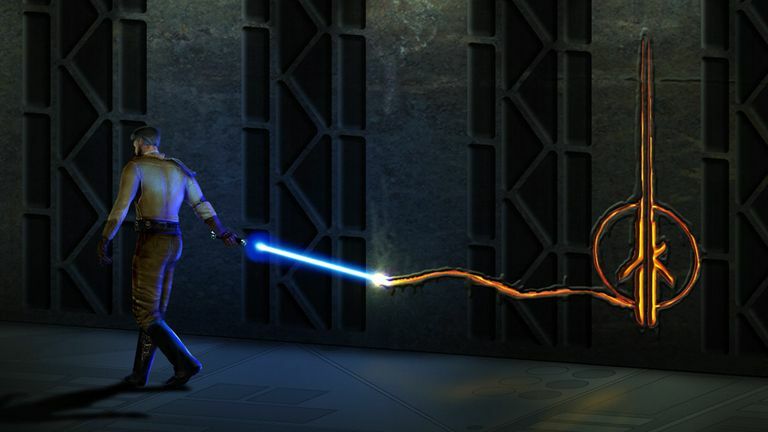 When sabers come together in Jedi Knight II, they can clash off each other, skim each other or lock together in a classic battle of wills, with a series of button clicks determining who comes out on top. Hit boxes, while not perfect, are also tight, and lead to very few deaths with little to no contact from a blade. These factors, combined with modest movement options that include flips and dodges, mean that it is totally possible to, say, duck under a horizontal lightsaber strike. And that is why duelling remains so engaging in Jedi Outcast, you are literally empowered by the engine to do cool sh*t like ducking under a lightsaber or backflipping to safety away from a vertical strike. Combine this with added complexity of force powers and suddenly you've got a combat system where you need to successfully marry style, movement and powers to stand a chance of winning - you've got to be switched on as, if you're not, you'll get taken out in one or two blows. I tell you there's nothing better than being down to your last sliver of health in Jedi Knight II, only to dodge, defend and strike perfectly to cut down an opponent who had the upper hand. Yes, you can deflect laser fire with your lightsaber in Jedi Knight II. You mustn't lose your head when going toe-to-toe with another lightsaber user. I'm telling you, if you haven't played Jedi Knight II before, then when you first have to take on another lightsaber wielder, be that one of the baddies in the game or a real life opponent in multiplayer, you will be afraid. Or, after you've lost a hand a couple of times you will be for sure. The transition from alive and fighting to lying on the floor without a limb can be brutal. Oh yeh, I didn't mention that did I, dismemberment can be enabled in Jedi Knight II. Thanks to some console commands in single player, or some mods in multiplayer, dismemberment can be switched on so that you and your enemies can lose hands, legs and heads. There is no blood, so it's not gruesome, but it leads to some pretty cool conclusions to showdowns. The losing your hand animation is particularly good. Look, I'm not saying that to make a good Star Wars game with lightsabers then you just need to add in dismemberment, no not at all. What I'm saying is that with the dismemberment added to the fiction-realistic lightsabers and solid physics engine, it just makes Jedi Knight II a more complete, cinematic experience. Luke, Count Dooku, Anakin and more have lost limbs in the Star Wars films to lightsaber strikes, so seeing dismemberment in the games - especially for your own character - is authentic. It's another string in Jedi Outcast's bow and, even now 13 years down the line, helps to keep it an intense and cool experience. Yes, Luke Skywalker is in Jedi Knight II, and no he is not voiced by Mark Hamill. Kyle Katarn is one of the less annoying extended universe characters. There are numerous cantinas where the music is suitably rinky-tink. Using the Dark Side's force powers - such as Force Grip - is lots of fun. Equally, using Force Push to send stormtroopers plummeting to their deaths is super. Luke Skywalker makes an appearance and you can fight alongside him. Dasaan and Tavion are good, albeit cartoonish, bad guys. You can fry those useless box droids on legs that appear in the original trilogy. Your character is grey, sitting between the Jedi and the Sith. At the end of the day the game certainly isn't without its flaws though, with some mid-game filler, old-fashioned lack of direction and B-movie, hokum plot, reminding you that you are playing a videogame that is over a decade old. However, it gets the basics of what being a Jedi is like in the films and that, in my opinion, makes it a cut above other games and a title that you should definitely seek out if you like Star Wars. Oh, and play it on PC or Mac - the force is not as strong in the console ports.